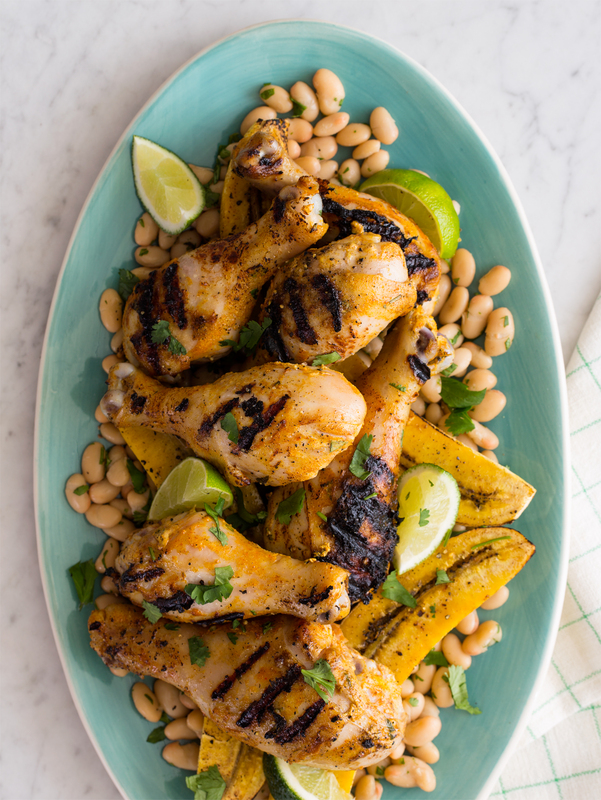 Curry Yogurt Grilled Chicken with Cilantro White Beans and Roasted Plantains is one of those all in one recipes. We love us some grilling recipes for summer, and this one is a pretty yummy. The yogurt helps the chicken stay juicy, and the curry is just delicious. 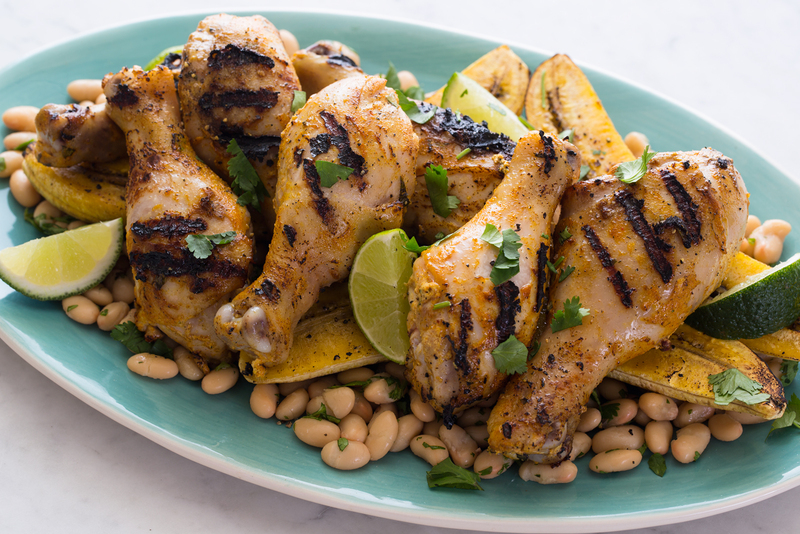 We paired the chicken with roasted plantains and white beans which easily rounds out this whole thing into a yummy meal. Yay chicken! Yay grilling! 1. For chicken: Place yogurt, buttermilk, lime juice, curry powder, cumin, coriander, paprika, and cinnamon into a large mixing bowl and whisk together. 2. Place chicken into a baking dish and season with salt and pepper. Pour yogurt mixture over chicken until fully coated. Cover and refrigerate for 3 to 6 hours. 3. Turn grill onto medium-high heat and brush surface with oil. 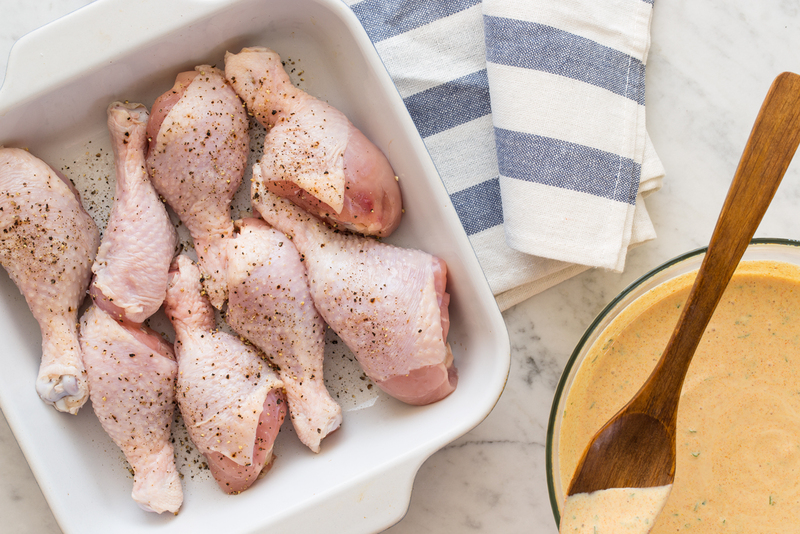 Remove chicken from marinade and shake pieces to remove excess. Place onto grill, about 1/2 inch apart and season with salt and pepper. 4. Grill chicken for 10 to 12 minutes, flip and continue to grill for an additional 7 to 9 minutes. 5. For plantains: Preheat oven to 375˚F. 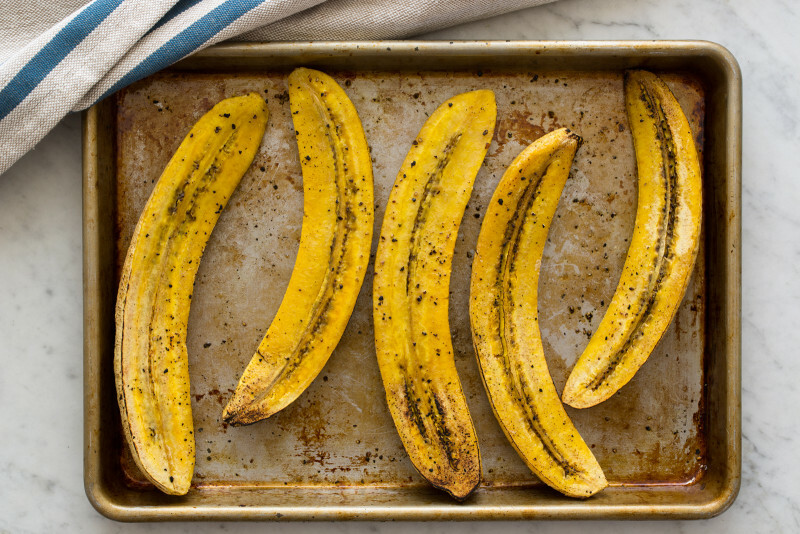 Place plantains onto a baking sheet and brush both sides with oil. Generously sprinkle plantains with cumin, salt and pepper and roast for 20 to 25 minutes. Add 1/2 cup water over plantains to soften/steam and continue to roast for 5 to 7 minutes. 6. For cilantro white beans: Pour beans cilantro, garlic, lime juice, salt, and pepper into a mixing bowl and toss together. 7. To assemble: Spread beans onto a large platter and top with plantains. Pile chicken over plantains and finish with a sprinkle of cilantro and lime wedges. Serve. Here in South africa I never heard of Plantines, to me it looks like Bananna, or is it from the squash family? Plantains definitely look like bananas, but are actually more similar in taste and texture to potatoes. They’re quite tough and starchy, but great in a variety of dishes!